Don't get me wrong - I love it when people tag me in or send me shark videos and pictures. I do feel like I've reached some sort of life goal when that happens. 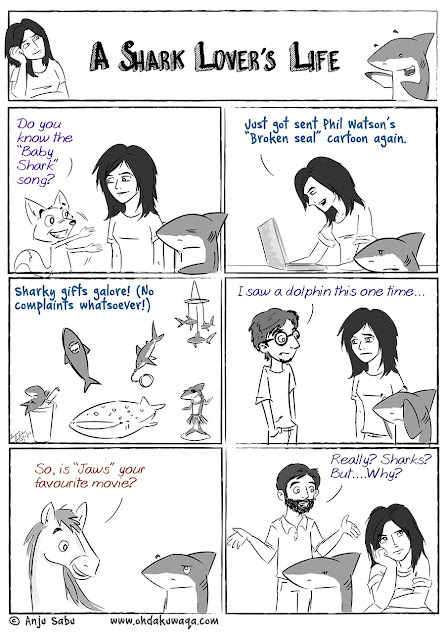 For those of you who don't know Phil Watson, check out Shaaark! I only realised after I drew the Fox that Pink Fong's Baby Shark version has a fox as their mascot. I first heard the Baby Shark song at a camp about 15 years ago. It was just as cool then as it is now. I still get asked why sharks every now and then. I'm working on the perfect response.